The holidays are made for celebrating, and this usually includes lots of food and fun! Here are some of FAACT’s reminders and tips, as you prepare for the holiday season. • Read labels each and every time before eating any food product. Ingredients can change over time, or may vary depending upon the size of the product (e.g. jumbo vs snack size). • Call the company to inquire about how their products are processed, their cleaning methods, and how items are packaged. • Seeking out products produced in a “dedicated” facility can add an additional level of security to ensure that food is safe. Visit FAACT’s Web site to find more label reading tips. Cross-contact can occur through incidental contact with utensils, pots and pans, and preparation surfaces. • When cleaning surfaces (such as desks, counters, tables, airline seats or tray tables, etc. ), use a wipe that contains a commercial detergent (e.g., Clorox®, Lysol®, etc), or apply a spray-on detergent (e.g. Formula 409®, Fantastic®, Windex® Multi-Surface, etc.) and vigorously wipe the area that has come into contact with the allergen. In a 2004 study, dish soap did not remove peanut allergen. • Run contaminated pots, pans, and utensils through a normal dishwasher cycle or wash them by hand with hot, soapy water and scrub the surfaces thoroughly. Use a sponge, scouring pad, or dish rag that has not come into contact with the allergen. Rinse and dry thoroughly with a clean towel. Avoid just wiping down a knife or common utensil with a rag after touching an allergen. • For washing hands or face, use warm/hot, soapy water or a commercial “tidy” wipe. Hand sanitizing gel is not sufficient to remove allergens. Visit FAACT’s Web site to learn more about cross-contact. Enjoy Life Foods has baking mixes that are simple to make by only adding oil, water, and of course more chocolate if desired! Top 8 allergen-free, these mixes are perfect to have on hand, especially when you need to bake something fast. You can melt chocolate into candy molds or dip your favorite item for a delicious chocolaty treat. Enjoy Life Foods has directions for melting their allergen-friendly chocolate and also several other recipes you might enjoy. When baking, bake plenty of extra cookies or brownies and freeze them. They’re a great solution when you’re given short notice about needing a “safe treat” for your child at school. This is also a great way to make sugar cookies in advance. Thaw on the day you plan to use them, and just simply add the icing. They’ll taste as fresh as the day you made them! If you’re looking to find classic Christmas cookie recipes and crafts that are allergy-friendly, visit Allergy Free Zone’s Pinterest page. Also, be sure to mark your allergy-safe items to avoid any confusion. Use stickers, signs, or another method to remind your child and others that the baked goods are safe. Don’t forget to remind your child (and others) about the food safety rules. This includes washing hands before eating and NEVER eating anything that hasn’t been approved first. 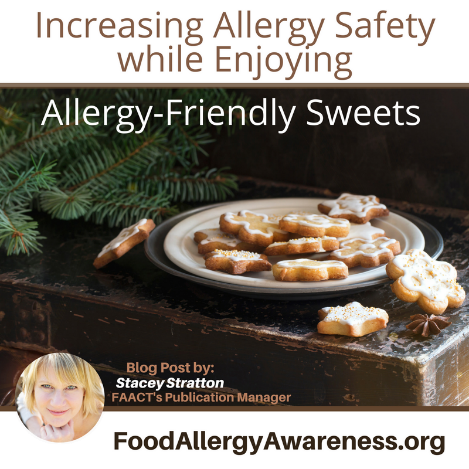 Stacey Stratton is FAACT’s Publications Manager and founder of the Allergy Free Zone. Stacey is committed to educating and advocating for all individuals and families affected by food allergies and anaphylaxis.